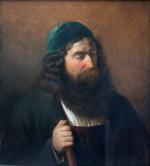 High quality portrait of a Jewish scholar was executed ca. in 1850-1860s and despite the absence of a signature had very close stylistic criteria to be attributed to the hand of renown Austrian portrait painter Friedrich von Amerling ( 1803-1887) or an artist from his circle. 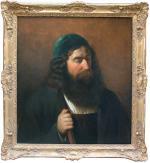 Friedrich Amerling is one of the most popular portraitists of the Austrian high society. About 1000 portraits were created by Amerling, a lot is unsigned and many of them are now missing. Works of Amerling are displayed in the greatest museums worldwide. 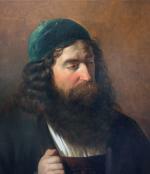 Due to our research there are two very similar versions of this portrait by Amerling in different sources: one of them is „Portrait of a rabbi“ estimated for sale in Christie’s London in 2003 (source:date base artnet.com ) and can be seen on our additional image. It is smaller dimensions as our and without stick . Another one (without image) was described in famous German catalog of Amerling’s works by Friedrich von Boetticher, page 160, No. 1261. Here is our free English translation: „.. A Scholar. 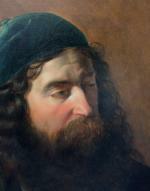 Half face, head 3/4 to the right, white shirt, red breastplate, reddish blond hair and beard, on the head a GREEN CAP. 68 x 42 1/2..“. Literature: Sabine Grabner „ Friedrich von Amerling“, exhibition catalogue in the Viennese Belvedere on 26.03-22.07.2003; G.Probszt „ Friedrich von Amerling“, catalog of works, p.160, Vienna, 1927; General Artist´s Lexicon " by Thieme/Becker. Technique: oil on canvas . 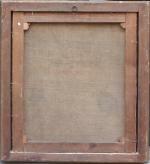 Antique gold-plated frame. Measurements: unframed w 222 7/8" x h 26" (58 x 66 cm ), framed 28" x 31 1/8" ( 71 x 79 cm ).